If you want a great family vehicle that can handle just about anything you can throw at it, a full-size SUV crossover is hard to beat. The Ford Explorer is a great example of a thoroughly modern interpretation of the SUV genre, but it's not a segment of the market where any one model is particularly dominant. To see how the good the Explorer of today is, let's do a 2017 Ford Explorer vs 2017 Jeep Grand Cherokee comparison to see which one comes out on top in a Ford vs Jeep head-to-head. There are still some crossovers around that haven't thrown off their 1980s truck-based SUV clothing. But the majority of models are now much more modern and sporty than their forefathers, and the 2017 Ford Explorer and the 2017 Jeep Grand Cherokee are two great examples of how modern crossovers should look. Both vehicles are sleek, handsome and sporty, and as they bear more than a passing resemblance to each other we'll declare the first round of our Explorer vs Grand Cherokee comparison a draw. While more retro crossovers and SUVs often only have a single powertrain in their ranges, the modern approach of Ford and Jeep sees multiple engine options for both vehicles. There are three different powerplants in the Explorer, and the Grand Cherokee goes one better with four. The 2017 Explorer has a standard 3.5-liter V-6, a 2.4-liter EcoBoost inline-four and a 365 horsepower twin-turbo 3.5-liter EcoBoost V-6. The smallest engine in the Jeep lineup is a 295 horsepower 3.6-liter V-6, and at the other end of the spectrum is a 475 horsepower 6.4-liter V-8. There's even a diesel now too, so this is an easy win for the Jeep. Standard kit in the base Explorer includes: power windows, mirrors, and locks; Bluetooth connectivity; cruise control; cloth upholstery; steering-wheel controls and an AM/FM/CD stereo with a 4.2-inch display. Go up a trim to the XLT trim and you then get 18-inch alloy wheels, keyless ignition, a chrome-colored lower fascia, satellite radio, and 10-way power driver's seat. The Grand Cherokee also comes very generously equipped, and even the omission of a standard rearview camera and parking sensors has been rectified for 2017, so this round has to be another draw. Some of the latest and most advanced safety features are not yet found in the 2017 Explorer, but the inherent safety of this big, imposing vehicle isn't impaired by the lack of something like automatic emergency braking. What most people want to know about are crash test ratings, and the NHTSA gives the Explorer a full five star rating for overall safety. The Grand Cherokee also lacks some of the latest safety kit, and although it doesn’t look like an ageing vehicle, its safety ratings are starting to decline. Rear-wheel drive models only get four stars from the NHTSA, so this is a win for the Explorer. There's very little to choose between these two sensational vehicles, but the standard seven-seat configuration of the Explorer does give a family friendly edge over the Jeep and that's why it's our winner here. 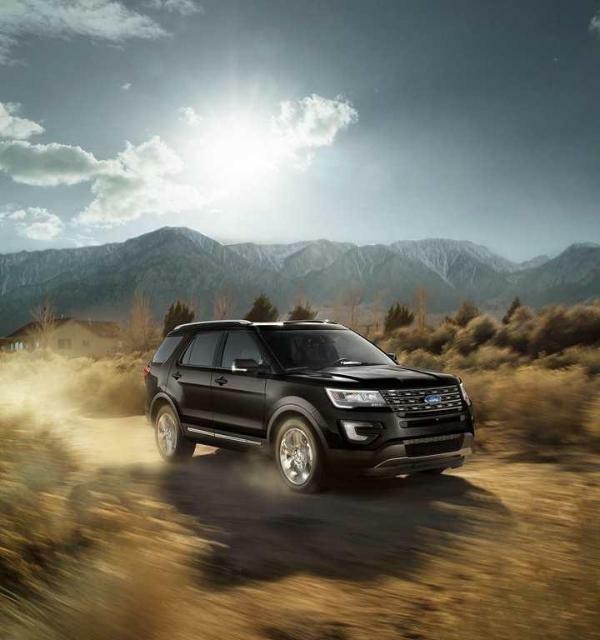 For more information on the 2017 Ford Explorer and to arrange a test drive, don’t hesitate to get in touch with Southern California Ford Dealers today.